Special Containment Procedures: The area SCP-821 is located in has been purchased by the Foundation, with a standard containment warehouse constructed around it, designated Containment Outpost 821. Daily inspections of SCP-821's exterior structure are to be performed by security personnel, with any significant changes being reported to the containment supervisor. No personnel are to enter SCP-821 due to its structural instability. 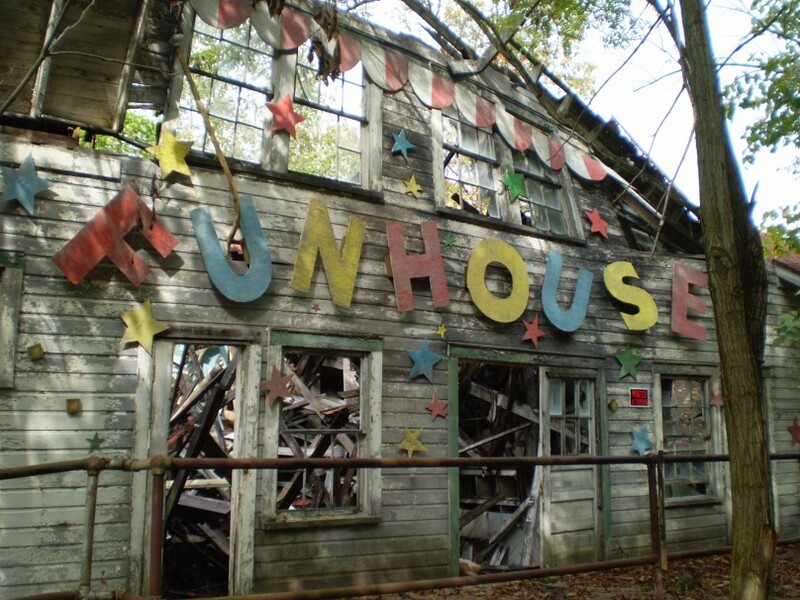 Description: SCP-821 is a structure located within the former town of Esheville, FL. Records recovered from the local government indicate it was constructed sometime between 1955-1957. The interior is in a permanent state of degradation, with all attempts at maintenance or restoration being unsuccessful. Models of animals that were attached to the carousel would move autonomously. Animatronics were shown to be able to engage prepubescent subjects in conversation. Food and drink were produced within SCP-821 without a source. Midway games that would emit vocalizations complimenting users with high scores. The animatronic band was composed of four machines, each playing a different instrument. Once per hour, they would play a set of popular songs from 1957-1960. When not playing, these animatronics could communicate with subjects observing them, and were capable of conducting basic conversation. Notably, vocalizations produced in this manner were shown to be unique, with logs compiled between 1959-1961 showing that no conversation had been repeated. However, following Incident SCP-821-A, all instances of SCP-821-1 were apparently destroyed or otherwise removed, and SCP-821 began to exhibit rapid structural deterioration. The devices contained within SCP-821 began to function erratically, showing much more dangerous properties than had previously been observed. In addition, SCP-821 itself is no longer safe to enter due to its structural damage. Alterations to devices include portions of the carousel and animatronic band becoming aggressive, striking and biting any subjects that approached them. Notably, portions of SCP-821 capable of speech were highly apologetic, offering to assist the subject that had been injured. Currently, no components of SCP-821 capable of producing speech are functional. On 4/11/1989, personnel attempting to enter SCP-821 found that the entrance had been sealed off, and a note labeled "OUT OF BUSINESS" affixed to the door. Investigation into SCP-821's interior showed that no instances of SCP-821-1 could be located. In the center of the main floor, a letter was found. The text of the letter has been included in this report. As of 5/16/1999, SCP-821 has been designated as neutralized. Hello my friends. This is a day we have all been dreading, and I am sad to be the one who has to break the news. You've all known for awhile that Funland has been having troubled times for a very long while, and although times were tough, we always managed to pull through. But we can't do it anymore. I've seen the parks and attractions that come from the huge amusement companies, and we just can't compete. The children just aren't interested in old places like this. The skee-ball, Big Bertha's show plaza, the carousel… they just don't care. They're bored by it. The world has moved on. I know that each of you has put a lifetime into making Funland a success, and that's the hardest thing for me. Each of you will receive a generous severance package, followed by a pass to return to your home. Thank you for your service.